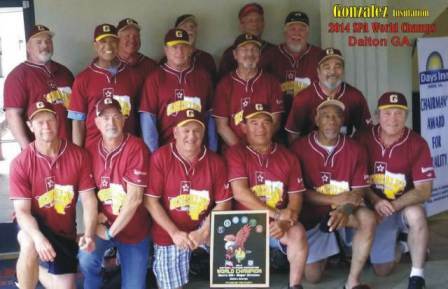 DALTON, GEORGIA – If ever a team lived up to their name it was the CHICAGO HITMEN, who captured the SPA 2014 WORLD 65 AA CHAMPIONSHIP at DALTON, GEORGIA'S HERITAGE POINT PARK, SEPTEMBER 11-14. Over seven games (3 pool, 4 bracket) the HITMEN batted .769 outscored their opponents 152 (21.7) to 90 (12.8) and won all seven games in the nine-team 65 AA field. The games SABATINO was referring to were the tournament pool play opener against the DAYTON LEGENDS and the two final bracket games against THE FIRM. Against DAYTON, the WINDY CITY guys trailed 21-12 heading into the seventh and erupted for 10 runs to win 22-21. Against THE FIRM in the winner's bracket, the HITMEN rallied from a 17-12 deficit in the fifth inning to erupt for 22 runs in the final innings for a 34-17 win. The championship game against THE FIRM was almost a duplication as the HITMEN trailed 18-12 fifth inning. 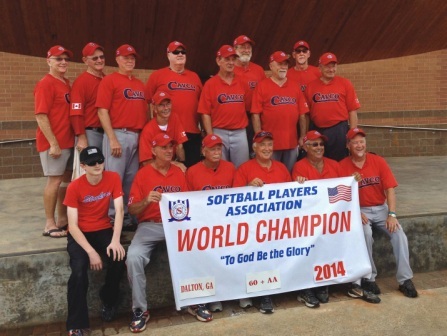 They responded by scoring five runs in the sixth inning and 14 in the seventh for 31-20 championship clinching win. SABATINO claims the way his team continually responded was due to patience, attitude and never giving up, even when they were behind. They gave it best they had. The manager also stated they never take any team for granted and are usually prepared when they face that team in the tournament. Another edge the HITMEN have is they have nine players who who have been together since 2008. Over that span the team has won 70-percent of their tournament games but this is their first SPA WORLD TITLE. “We have come close a few times but this is the first time we have all been healthy coming to the tournament and that really made a difference,' SABATINO said. The nine who have been with the team for the ten years are: STEVE DECORI (RC, .741), JOHN DOYLE (DNP), FELIX GARCIA (3B,.680), CO-MANAGER JIM KUPIEC (P. .800), RICK MASINO (P,.610), SABATINO (RF,.680), PHIL WHITMAN (C, .650), STEVE GAJDA (SS, .680) and DAN TODD (LF, .667). 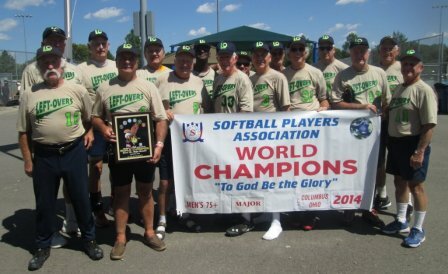 Others on the team are: DAVID ABNEY (DVD), MIKE MCLENNAND (1B, .778), RICHARD DAHM (DNP), MIKE CHASTAIN (2B, .679), BUBBA RUSSELL (C/1B, .739) and TOURNAMENT MVP WARREN YORK (LC,.852). The speedy left center fielder in addition to making outstanding defensive plays with both his arm and glove batted .852 to lead the team in hitting. Joining YORK on the ALL-AMERICAN team were DECORI, KUPIEC, WHITMEN, CHASTAIN and GAJDA. 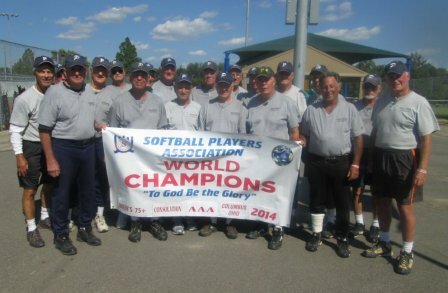 The team's sponsor is SUPREME LOBSTER OF VILLA PARK, ILLINOIS, owned by DOMINIC STRAMAGLIA..
“DOMINIC has been sponsoring area softball and little league teams for at least 15 years and has been our sponsor since 2004,” SABATINO said, “He is really a great guy and his SEAFOOD is top of the line. He also ships from west coast to east coast and anywhere in-between"
Although the HITMEN have won other tournaments over the years, SABATINO says the team peaked at DALTON. As for the SPA, SABATINO gave both RIDGE HOOKS, the staff and the tournament high marks. DALTON, GEORGIA – Some times an unexpected mishap can turn into the biggest positive occurrence which could be experienced. Such was the case at the opening ceremonies of the SPA 60 AA DIVISION WORLD CHAMPIONSHIPS at DALTON, GEORGIA SEPTEMBER 11-14. Ah, but HOOKS and his opening ceremonies were still not out of the woods. All was not lost as two members of the CAVCO SPORTS 60'S contingent volunteered to sing the anthem a cappella. Stepping up to do the honors were TOM MCNORTON and AGNES DANDREA. Not only did they sing the anthem in perfect pitch but also added the French version. It was the highlight of the Opening Ceremonies. HOOKS also praised the CAVCO ladies for their baskets for the raffle at the LADIES BREAKFAST. 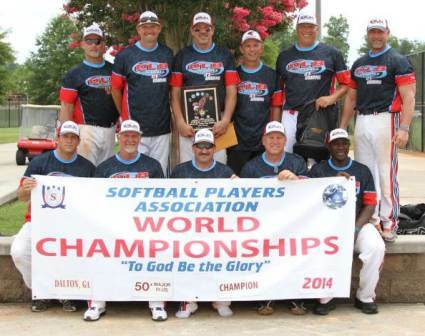 While the CAVCO LADIES did their part off the field, the men did theirs' on the field winning the SPA 2014 60 AA WORLD CHAMPIONSHIP. In addition, MCNORTON, who was half of the anthem singing duet was just as good on the field, earning ALL-AMERICAN selection. Not bad for a CANADIAN. And guess what. In the flag ceremony, the American contingent even raised the MAPLE LEAF right side up. It was a great day to be CANADIAN. DALTON, GEORGIA – Southern Hospitality went a long way at the 2014 SPA 60 AA WORLD CHAMPIONSHIPS held at DALTON, GEORGIA'S HERITAGE POINT PARK, SEPTEMBER 11-14. Taking advantage of the PEACH STATES warm welcome, CAVCO SPORTS from WINDSOR, ONTARAIO, CANADA won all five of their games (pool and bracket) to capture the SPA 60 AA WORLD CROWN. 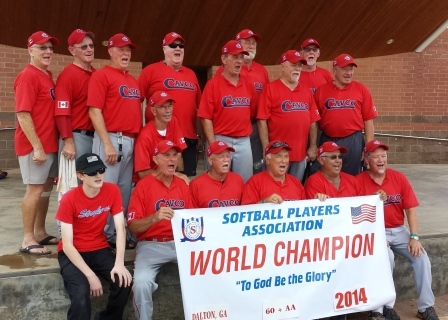 “It was really a great feeling to come down to the States for a SPA WORLD CHAMPIONSHIP TOURNAMENT and end up winning our division,” CAVCO SPORTS MANAGER JOHN GOZ said. Although it was their first appearance at the SPA WORLDS and of course their first SPA WORLD title, they are not strangers to other USA SPA regional tournaments. The reasons GOZ gave for CAVCO playing more tournaments in the States than CANADA is simply more fun playing in the states. 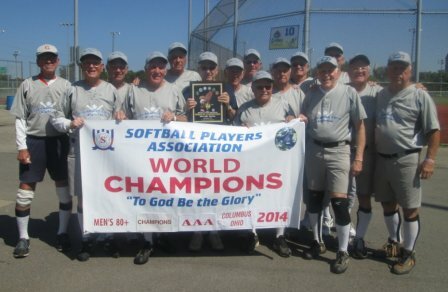 They also get to see different teams, use senior bats and have better softballs and above all, they like the way SPA conducts their tournaments. “Over the past years we have played some really good teams and built some great friendships with teams like THE BOMB SQUAD, SYLVANIA and INDY FOG to name a few,” GOZ added. Although CAVCO has held its own at SPA tournaments over the years, 2014 did not start off like it would be a banner year. “We went 2-3 in DAYTON, 0-6 at BARBERTON, won SHELBYVILLE but finished third at SYLVANIA. It sure wasn't looking too good for us,” GOZ explained. Even at DALTON things didn't look like it would be a good tournament for the ONTARIO team. GOZ should not have worried because in their next pool game they beat the DALLAS SPURS 23-8. The surge continued in bracket play as they beat the INDY FOG 24-11 in the opener and then the TENNESSEE 60's twice by 19-12 and 18-16 to win the tournament. “We were lucky, the games against TENNESSEE could have gone either way but we made great plays at the right time and had sustained hitting throughout the order and in every inning,” the manager said. CAVCO SPORTS is made up mostly of players from house league and senior leagues in the WINDSOR, ONTARIO area with all the players living in the general vicinity. MVP at the DALTON TOURNAMENT was pitcher WES SCOTT, who hit over .700 in addition to solidifying the defense with his pitching and fielding. TOM MCNORTON (3B), TERRY JOHNSTON (SS), JOHN CARPENTER (OF/P), GERRY LALIBERTY (C/INF) and CECIL PARR (C/1B) were selected to the tournament ALL-AMERICAN team. RICK ANDERSON (RF) was awarded the SPA 60 AA MANAGE-OF-THE-YEAR AWARD. "We really could have had anyone from the team be selected as an ALL-AMERICAN," GOZ explained, "We are so balanced and everyone contributes to our success. Others on the team were DON SOULLIERE (RCF), KEVIN SIVELL (OF), TONY D'ANDREA (P/C), KEVIN WOOD (OF), GARY BEACH (LF), DAVE BARIBEAU (LC/1B), BILL DUNNE (3B), BRIAN DOAN (1B/C), BOB TAYLOR (LC/2B), GOZ (1B), JOHN SHEREMETA (2B/SS), JOHN CECILE (3B) and BAT BOY CHARLEY JOHNSTON. Although the team is mainly self-sponsored, RICK CAVANAUGH, a former player and now business owner from the MISSISSAUGA area contributes around $1.500 each year to help the team with their expenses. Also a huge factor in the success of the team are the wives who accompany them to the tournaments. Making the trip to DALTON were MARY-LOU TAYLOR, KATHY BEACH, MARY-ANN BARIBEAU, AGNES D'ANDREA, LOUISE LALIBERTY, SUE ANDERSON, SAM MCNORTON, WENDY SIVELL and BARB JOHNSTON. GOZ credits the team's success to the camaraderie the players share. As for the DALTON tournament and SPA tournament in general, GOZ had this to say. “Lord willing, we will be back again in 2015,” he added.